Could This Be The Future Home Of The World's Loosest Poker Games. "Chinese businessmen" is a derogatory shorthand. They prefer to be called Oriental Entrepreneurs. gotta spend money to make money. economics 101. I've read the Asian company building it (Genting) is targeting Chinese tourists who now have the disposable income to travel. And of course gambling is practically the national pastime over there. I like the nickname Bob Stupak (The Polish Maverick) gave Johnny Chan - "The Orient Express". Stupak was the guy who put the astronaut and the space station (shaped like a roulette wheel) on the front of his hotel. He was a pretty good poker player too. He had a standing offer at his hotel where he would play anyone heads up for 10,000 cash. Here's a picture of his old hotel (notice the spaceman outside the roulette shaped space station). Knowing Stupak's level of ethics, I'd only take that offer if I got to pick the dealer, deck and poker room do it in. No way I would trust his dealers and decks. You gotta give action to get action. Well it looks like they finally started the project a couple months ago. Even competitor Steve Wynn was at the ground breaking. Only 3 years to go! this is a place i would gamble. asians do it right. 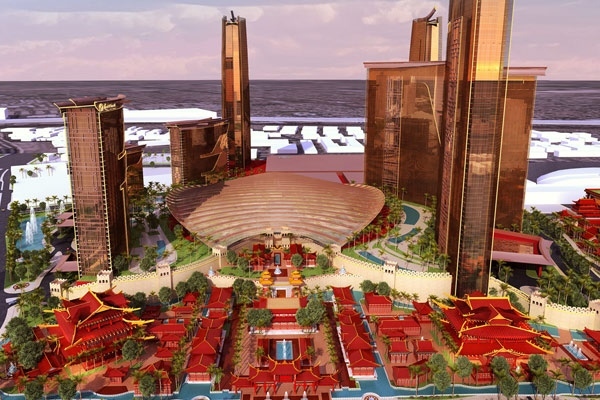 Looks like they are building yet another Asian themed hotel/casino in Vegas different from the one mentioned above. This other one will be called the Lucky Dragon. It will be smaller, only 10 stories, but it will have a 2 1/2 story glass dragon above the casino floor. The casino floor will have 37 gaming tables but it will be different because 3/4 of the tables will be baccarat. Watch out Vegas the Asians are coming. The Lucky Dragon will be on Sahara Ave. between the Strip and Interstate 5. Btw, the hotel pictured in post #1 which is located on the site of the old Stardust is scheduled to be completed in 2019. For the record, this joint opened last week. When you get there, let us know what it's like. I wonder if Ivey has checked out their baccarat tables yet. ivey and i rolled dice there last week. a little pre-tour of the facilities for certain high rollers. place is amazing. people are going to love it.